was first discovered in 1773 by 'Comet Ferret' Charles Messier. His friend Pierre Méchain spotted NGC 5195, the small tail below it in 1781. 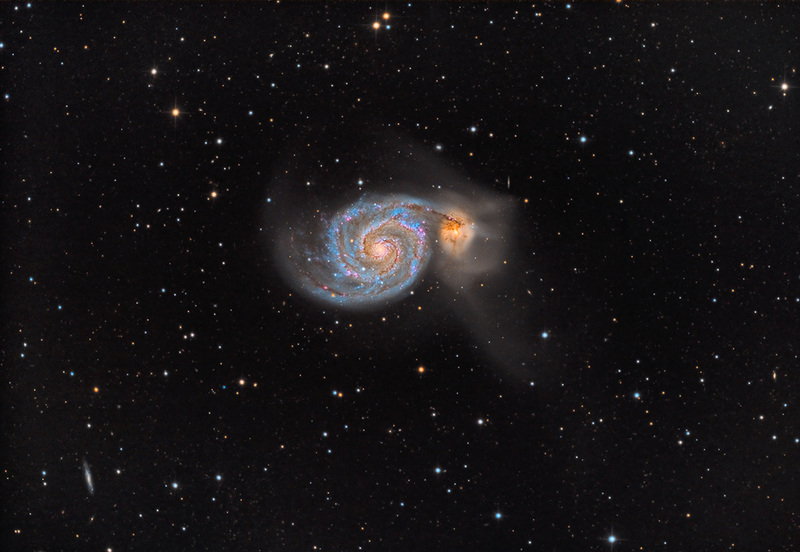 5195 was a separate galaxy captured by M51 in an ancient collision. Sixty-four years later, Ireland's William Parsons ('Lord Rosse') first observed The Whirlpool's spiral structure with his Leviathan Reflector. Though such 'nebulae' were not confirmed to be beyond our galaxy until Edwin Hubble, Rosse was the first to define the spiral nature of them with his observations of this very object. Edge-On IC 4263 appears at 10 o'clock, while several smaller galaxies surround the primary target. Thanks to Mr. John Batts for this fine data.